Let’s start with a foundational definition: what is inbound marketing? As defined by Hubspot, inbound marketing attracts customers (or in this case, patients) through relevant and helpful content. With inbound marketing, potential patients find you through channels like blogs, search engines, and social media. By creating content designed to address the problems and needs of your ideal patients, you attract qualified prospects and build trust and credibility for your hospital. When properly executed, inbound marketing is 10x more effective than other marketing strategies. It can also cost 62% less than traditional marketing and typically results in triple the leads. With tightening marketing budgets and an increased emphasis on proving ROI, inbound marketing is a cost effective way to reach new prospects. Below are three strategies that will help you kick-start or improve your inbound marketing engine. SEO is the process of getting traffic from the free, organic search results of search engines. All major search engines, like Google, rank search results based on what the search engine considers most relevant to users. Optimizing your site’s SEO is a free way to improve how high you rank in search results. For instance, if your hospital specializes in women’s health, maternity care, labor, and delivery, you want to show up towards the top of the first search page when someone looks up terms relevant to these areas of interest. For this reason, keywords should be your first point of focus when developing a SEO strategy. Keywords are the words or phrases that define the content of a webpage and should be part of the page description. Back to the women’s health example, start by developing a list of keywords associated with this service line. Your keyword list should include words you know are commonly associated with women’s health, maternity care, labor, and delivery. For a more thorough approach, include keywords and phrases you hear from patients, as people tend to search the way they talk. Pay attention to the terms are they using. Integrate those “everyday words” into your website copy, making it more engaging and relevant. So, the more relevant and relatable your keywords, the more likely you will be to reach those patients. With voice commands becoming ever more popular, everyday language on your website becomes more important as well. Page Title: Cleverly named, this is literally the title of the page. Located at the top of your tab, it is the biggest text shown in the search results. [See photo below for a visual reference]. URL Structure: We all know what a URL is, but did you know the structure actually informs search engines about the hierarchy of your website and provides insight about what services you offer? For instance, you start with your domain.com, then typically you build your website by product lines or divisions of your business. In the end, your URL structure it could look something like this: hospitalname.com/product-line. This structure tells search engines that you are a hospital and you offer these product lines. Meta Description: Along with your page title and url, the meta description helps further explain what your webpage is about. While it does provide a description, it can also entice people to click on the page. By giving a great description of your page, it can confirm to searchers that this page is exactly what they are looking for. Consider including your location as a keyword in your meta description. This will help search engines and patients identify where you are located. 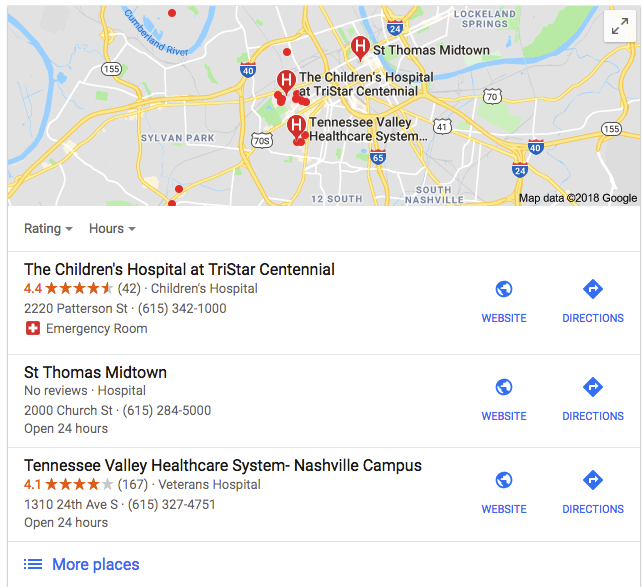 Location is important with local SEO efforts, particularly so within healthcare. Make sure your name, address, and phone number match on all online directories such as Yelp, the Yellow Pages, and local community listings. The biggest online directory is Google My Business (GMB). Proper setup of your GMB will improve how your are displayed in Google’s local map. When someone searches for a ‘Product Line’ in ‘Your Area,’ this will help you show up in the top results of Google’s map. GMB is easy to use and will walk you through every step necessary to become a verified listing. Key ways to optimize your GMB include: having a good description, proper category listing, and at least three photos. There are also great tools out there, like MOZ, that can help you see how your hospital is displayed through all local directories. Another great way to help your SEO ranking and establish credibility is to have online reviews. Word of mouth has always been the most valuable marketing tool, especially in healthcare. Online reviews are equivalent to “word of mouth” recommendations on the internet. They build trust and instill a sense of comfort for patients before they even walk into your facility. Where should you focus your reviews? There are so many places you can leave reviews nowadays. The list includes Healthgrade, Yelp, Google, Facebook, and even insurance companies. We suggest starting with Google. Not only does Google use your reviews for a search ranking factor, consumers also trust Google and health insurance websites over any other source, according to Reputation.com. After getting a good base with Google, start asking for reviews on insurance websites. Worried about how to get reviews? Just ask! 68% of consumers left a local business review when asked with 74% having been asked for their feedback. Build this into your patient experience: have someone at the facility ask in-person and also follow up by sending an email a few days after their visit to remind them. What about bad reviews? It’s best to respond and handle them as quickly as possible. Mistakes will happen and not everyone will be happy. But, it’s important to show prospective patients that when there is a problem, you are listening and do your best to appropriately handle it. Keep it educational, not sales focused: while there may be underlying growth goals driving you to create your content, it’s important that it remain primarily educational and informative. The more insightful the content, the more likely it will be shared and valued—leading to improved SEO and more eyes on your website. You may weave in a sales pitch and direct readers to take action, but the main goal should be to help your patients in some way. Be consistent: pick a time when you can regularly share new content and stick with it. The more often you can post, the better. Even if you can only commit to twice a month, make sure that is a schedule you can maintain. Be honest, open, and relatable: don’t be afraid to attach names to your content by listing doctors or field experts as authors to your posts. Consider tapping into leadership insights and share the vision and values of your C-Suite through blog content. Our Founder’s Perspective series has been a popular way for us to introduce our co-founder’s and share their observations. As you begin to more regularly attract patients to your site through content, consider introducing a lead generation tool. A lead generation tool is typically gated, meaning it requires users to provide some information about themselves before gaining access. You could simply request their email address, or you could ask for more—their name, location, or details about their health needs—in an effort to get to know the patients and potential patients who are interacting with the content on your site. Our innovation team recently created a site location traffic map, the Average Annual Daily Traffic (AADT) Map, as a way to engage with your online readers. For best results, your lead generation tool should provide value. Our mapping tool, for example, will highlight traffic counts and provide powerful insights into the movement of the population, assisting strategic planners with new site selections. As a hospital or health system, your team could offer a similar tool in the form of a free online health check. This offering would allow potential patients to list how often they exercise, answer diet questions, and detail general health inform. In exchange, they would receive a free basic health assessment. This assessment would offer valuable information and build trust with a potential patients, while providing your team with new prospects. While digital marketing has been around for some time, many healthcare providers have been slow to adopt these practices, either due to the uncertainties that can come with something new, or for fear that new marketing strategies may be too time consuming or difficult to learn. 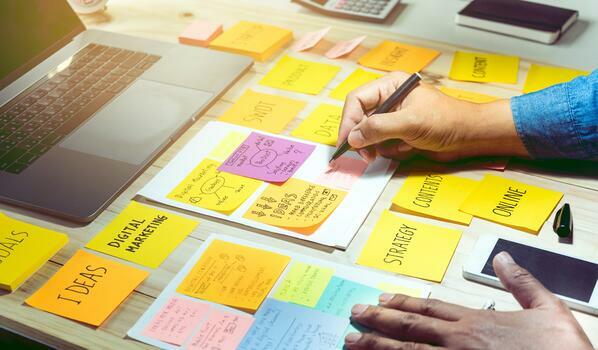 But, as budgets and teams continue to shrink, it may be worthwhile to consider leaving behind strategies of the past and investing in the more engaging and cost-effective ideas of inbound marketing. The direct-to-patient engagement that can come with this form of marketing and the increased interest from new prospects that can result from creating helpful, informative content, may surprise you. While the learning curve may be steep, and it takes time to build a proper inbound marketing engine, the end results are often worth the effort. For more information about our AADT Map or how you can engage our team to support your site location and expansion efforts, contact Sean Conway and schedule a discovery call today.